keyframe animations of relative mesh shapes as pose or morph animations. Download and integrate the Blender Exporter. Install Python. 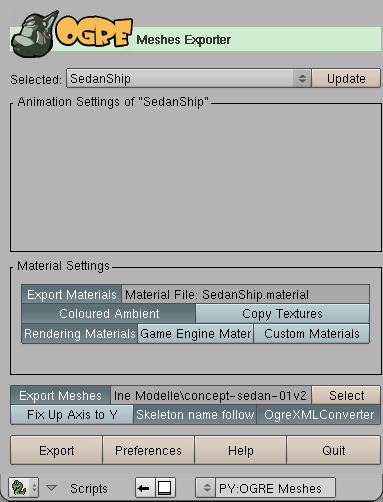 This is not needed for Blender itself, but for the exporter script. Choose the same Python version that is used as Base for your Blender version (you'll see it when you start Blender). Contributors to this page: paroj , TheOnlyJoey , spacegaier , Lf3THn4D , Beauty , jacmoe , ecoumans and OgreWikiBot . Page last modified on Thursday 27 of July, 2017 12:24:32 GMT-0000 by paroj.